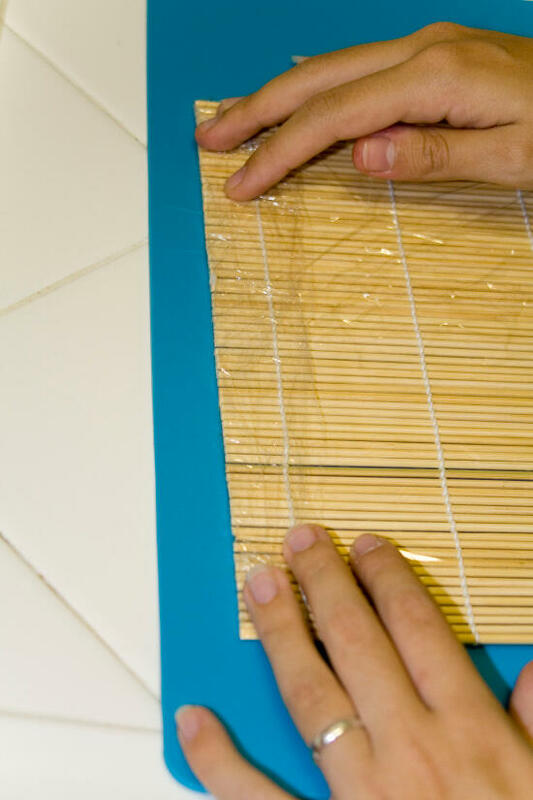 Lay out a piece of plastic wrap twice the length of the bamboo mat. The plastic wrap should be oriented so that the short side is near you. 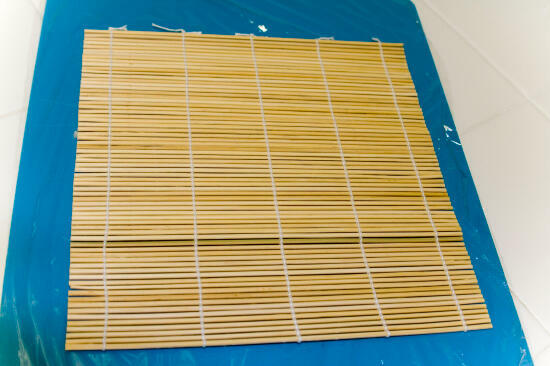 Lay the bamboo mat on the center of the plastic wrap, oriented the little bamboo sticks that make up the mat are parallel to the short end of the plastic wrap. 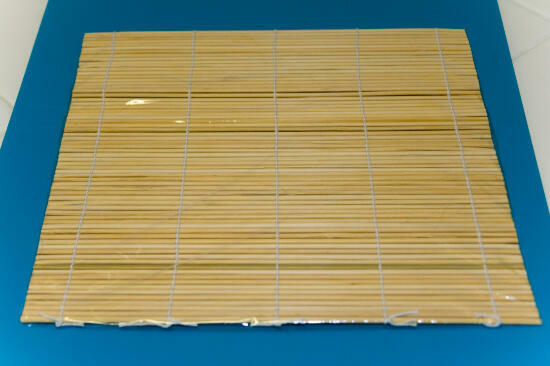 Fold the bottom end of the plastic wrap over the bamboo mat. 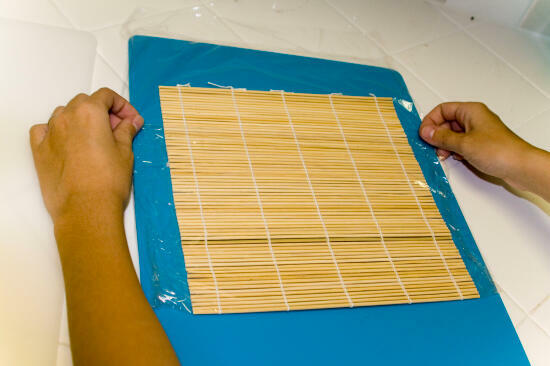 Fold the top end of the plastic wrap over the bamboo mat, pressing to make sure it sticks to the part that has already been folded over. Fold the corners in little triangles, so they don’t stick out. 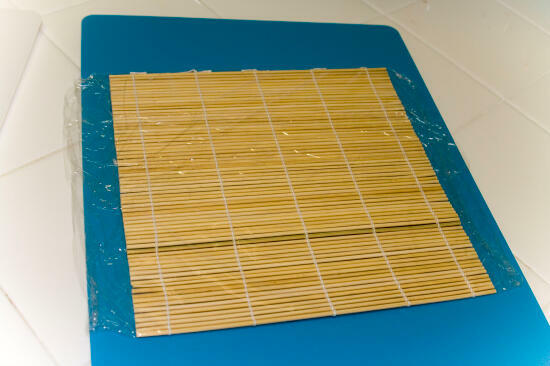 Fold the two sides in, making sure they stick to the plastic wrap that has already been folded in. Turn over so the folded parts are down, and start rolling your sushi! This is such a fun site. I’ve only been a sushi partaker for a little less than a year and love it! Thanks for the fun recipes and hints! Thanks Theresa! I’m glad you like it! Have fun making the sushi! I am planning a Chinese New Year coffee hour for my church congregation but am a total novice at rolling sushi. What would be a simple filling for the recipe offered on this site? I’d prefer vegetarian rather than fish to start with. I am starting to explore more things japanese. I have always had a love of bonsai plants, so much so that i made a site dedicated to them. I am waiting for a sushi bar to appear in my home town but no luck as yet, might try to make some myself and eat it surrounded by my bonsais! You should definitely try making sushi at home… it’s cheaper than eating at a sushi bar, and it’s a lot of fun. Have just started making sushi. 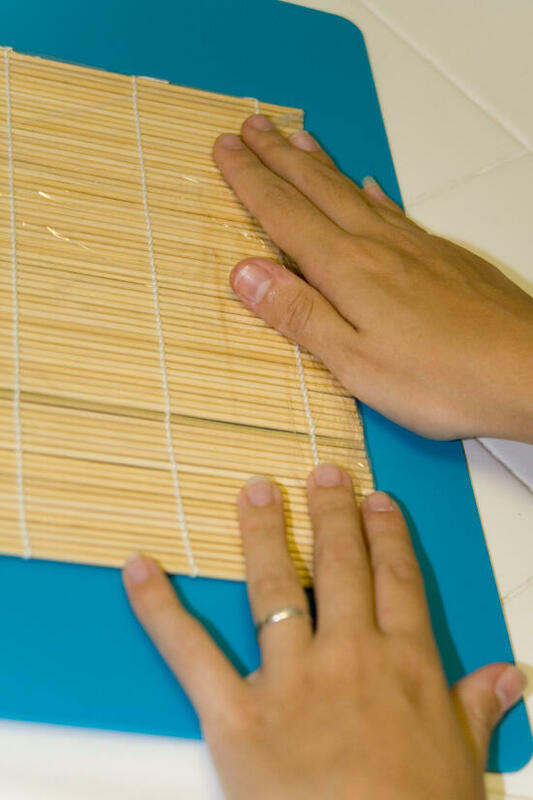 Why on earth does someone not make a plastic covered sushi mat??? Surely as most sites suggest plastic wrapping it, it is not such a silly question? Shouldn’t the plastic wrap be replaced after each meal?